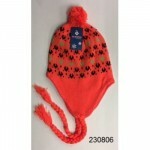 Wholesale winter hats sold by the case. 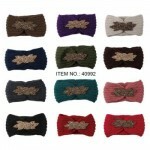 All our hats are made form quality materials. 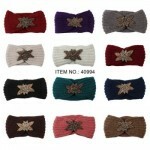 Ladies -n- Girls Knitted Hats $0.99 Each. 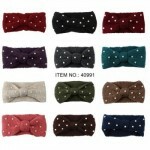 This all-time favorite roll-brim hat is soft and very stylish! 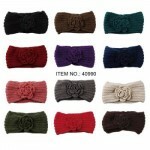 Imported in luxurious acrylic chenill..
Ladies Knit Winter Hat w/ Pom Pom $1.59 Each. 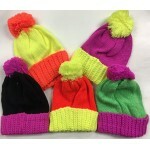 Ladies Winter Knitted Hat with Pom Pom in assorted colors.﻿Case of 144..
Ladies Thick Fur Lined Gloves w/ Flake $1.49 Each. 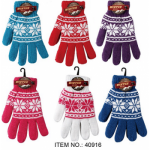 Women's knitted winter gloves with Thinsulate thermal lining.Case of 144 Pairs..
Ladies/Girls 2-Tone Knitted Hat w/ Pom Pom $1.59 Each. 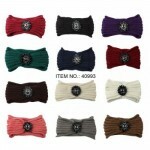 One size fits most and the come in 2-Tone Colors for that new look.Case of 144..
Men's Winter Cap $1.25 Each. 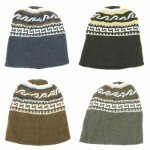 Aztec wave pattern winter hat .Case of 144..
Men's X-Sport Winter Hat $1.35 Each. 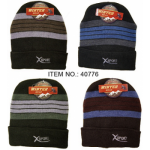 Men's X-Sport Knitted Hat.Case of 144.. 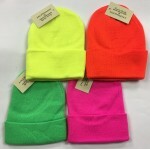 Neon Hat w/ Ear Flaps & Mohawk $1.39 Each. 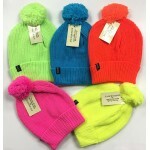 Winter Mohawk Cap in neon colors.Neon Green, Apple Green, Orange, Black & PinkCase of 144..